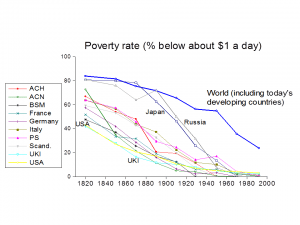 The world as a whole has made great progress in reducing the incidence of extreme poverty over the last 200 years, as can be seen from the graph below. The numbers are uncertain (and even more so as one goes further back in time). But as best can be determined, the proportion of the world’s population living in poverty fell from roughly four out of five in 1820 to less than one in five today. Source: Based on the estimates of the global distribution by Francois Bourguignon and Christian Morrisson, “Inequality among World Citizens: 1820-1992,” American Economic Review 92(4): 727-744, 2002. Poverty rates by country/region estimated by Martin Ravallion from the distributions kindly provided by Bourguignon and Christian Morrisson. Further details can be found here. Progress was far slower in reducing the count of the number of people living in such extreme poverty, which stated around one billion until the late 20th century. It was not until the late 20th century that we started to see falling numbers of people living in poverty by this standard. The good news is that there are fewer people living in extreme poverty in the world today than 30 years ago. While that is an achievement, continuing progress for poor people is far from assured. Inequalities in access to key resources threaten to stall growth and poverty reduction in many places. The world’s poorest have made only a small absolute gain over those 30 years. We have seen rising absolute gaps between rich and poor. Progress has been slow against relative poverty, judged by the standards of the country and time one lives in. And a great many people in the world’s emerging middle class remain vulnerable to falling back into poverty. (iii) Addressing the longstanding concerns about prevailing approaches to making inter-country comparisons of price levels facing poor people using the results of the International Comparison Program. A recent paper (also with Chen), “Welfare-Consistent Global Poverty Measures,” provides new measures of global poverty that take seriously the idea of relative-income comparisons but also acknowledge a deep identification problem when the latent norms defining poverty vary systematically across countries. Welfare-consistent measures are shown to be bounded below by a fixed absolute line and above by weakly-relative lines derived from a theoretical model of relative-income comparisons calibrated to data on national poverty lines. Both bounds indicate falling global poverty incidence, but more slowly for the upper bound. Either way, the developing world has a higher poverty incidence but is making more progress against poverty than the developed world. This figure provides the global count of the number of people living below the upper line. The count of the “absolutely poor in developing world” is the number of people living below the lower bound line, while the count of “relatively poor in developing world” is the number between the two bounds in the developing world. The counts for “high-income countries” are for the upper bound and are almost entirely relative poverty. As can be seen in the above Figure, the falling global count of the poor by the lower bound has come with a similar increase in the numbers of people in the developing world who are not poor by this measure but live below the upper bound. Slightly less than 80% of those who rise above the absolute lower bound end up living between the bounds—no longer poor by the global absolute line but still poor by standards typical of the country they live in. The considerable pace of progress against absolute global poverty in the income space that has been documented before in the literature is not found for the weakly relative lines that form our upper bound. But progress is still evident. The continuously relative measure (updating the line over time as well as across space) shows a declining poverty rate globally. This also holds for all regions, including the high-income countries, though the pace of progress against poverty has been noticeably less in those countries as a whole, and progress against relative poverty in the high-income countries has stalled since the Great Recession. The evident lack of progress against poverty in the rich world implied by our upper bound measures is primarily about the distribution of the gains from economic growth. Whether one focuses on absolute poverty (the lower bound) or relative poverty (upper bound), the incidence of poverty is appreciably higher in the developing world. Over 90% of the poor by the upper line are found in the developing world, which is home to virtually all of those who are poor by our lower line. However, the developing world has been making greater progress over time against poverty, judged by either bound. Side-by-side with the falling numbers of absolutely poor in the developing world, we find that there have been rising numbers of people who are still poor by the standards typical of the country they live in. Both the lower and upper-bound poverty measures are responsive to both the mean and inequality, although the upper bound measure responds less elastically. Is there more relative poverty in the rich world? We see that, prior to about 10 years ago, the relative poverty rate was higher in the rich world. But this is no longer the case. The success of the developing world against extreme absolute poverty has come with rising relative poverty. At the same time, the rich world has made little or no progress against poverty over the last decade; the overall poverty rate has stayed at about 18% since 2005. Behind the good news on the declining numbers of people living in extreme poverty, there are two more troubling things to note. First, alongside the falling numbers of absolutely poor, judged by a common international monetary standard, there have been rising numbers of relatively poor, when judged by the standards of the country one lives in, as we saw above. Second, it appears that there have been only modest gains in the level of living of the world’s poorest people, as shown in “Are the poorest left behind?” While the growth rate of mean consumption in the developing world has shown a marked increase since 2000, not much of that has reached the poorest. 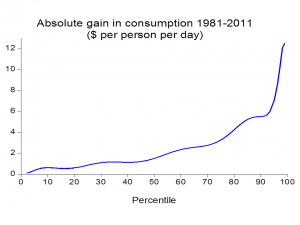 In other words, we are seeing fewer people living near the “consumption floor” but the level of the floor has not risen much above its biological level. 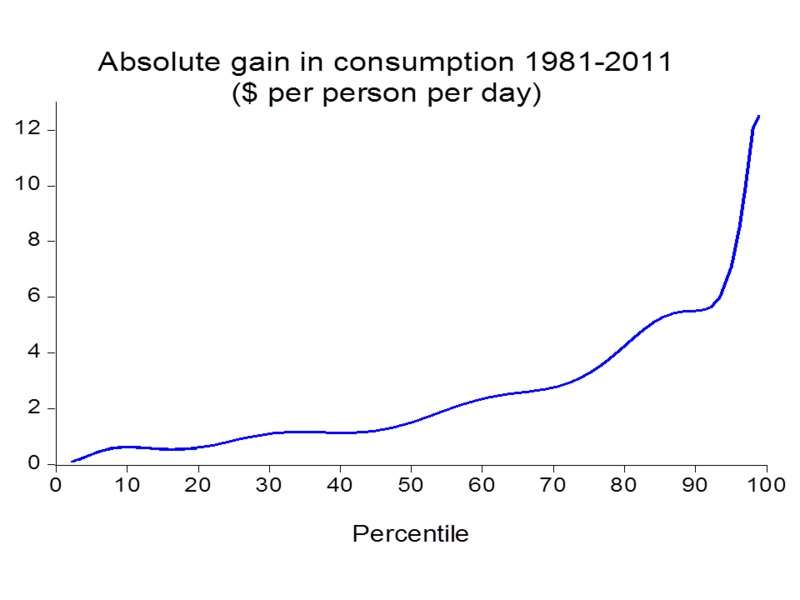 The graph shows the mean gain in consumption in the developing world as a whole over 1981-2011 by percentile from the poorest (p=1) to the richest (p=100).